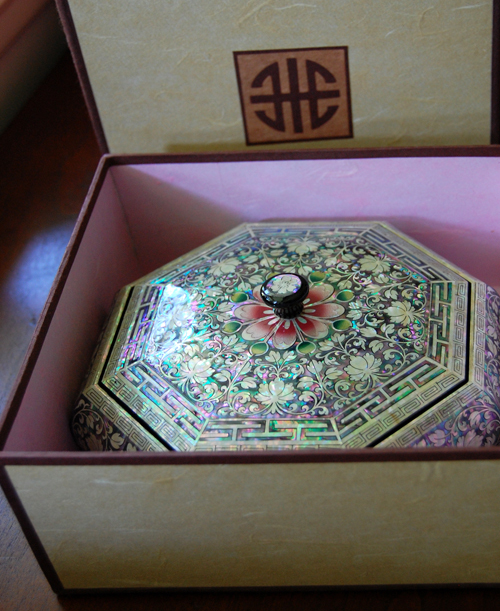 This exquisite octagonal lacquered wood box is embellished with a mother of pearl design of lotus blossoms in full bloom with rhythmic lines and whirls of vines. The lotus blossom is a symbol of the enlightened Buddha who is awakened and pure. It is a very auspicious symbol thought to bring luck and wisdom. The beautiful inner surface is also inlaid with iridescent mother of pearl. The cross shaped separator inside the box lifts out for multi-functional use. Beautifully enclosed in a traditional rice paper gift box and wrapped with a Jewel Tone wrapping scarf.